Sandra Oh wins SAG award for best actress in drama. January. 29, 2019 07:52. wizi@donga.com. Sandra Oh, the 48-year-old Canadian actress of Korean descent, has won her third best female lead award from the Screen Actors Guild Awards, following the honors she enjoyed from the Golden Globe Awards and National Critics of Films Critics awards. 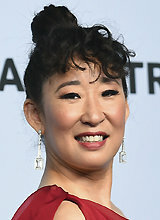 According to The Los Angeles Times, Sandra Oh won the title of Outstanding Performance by a Female Actor with her role as Eve Polastri in the BBC America TV drama “Killing Eve.” Other contenders included a constellation of actresses such as Elisabeth Moss of "The Handmaid’s Tale" as well as Laura Linney and Julia Garner from "Ozark." “Diversity (in Hollywood culture) is continuing to grow but has not reached the point yet,” said the Canadian actress, adding she will continue to make an effort to achieve diversity. On January 6, the talented actress of Korean descent was honored with the best female lead award in the 76th Golden Globes in Los Angeles.